The theme of banners' installation and placement via skilled Aparg SmartAd plugin was covered in one of the previous articles. This time, by the end of the article you will fill the gap of knowledge about the easy and effective creation of banners. No need to worry! This guide will represent three powerful and functionally saturated online tools which will help you to completely create the banners for further displaying them on your WordPress website. 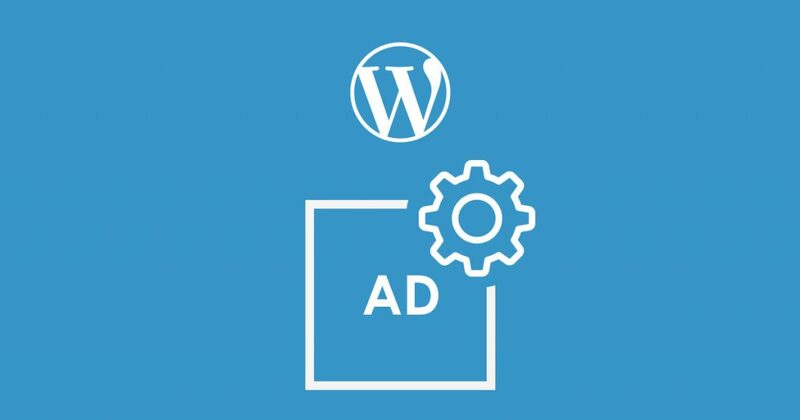 As a multi functional WordPress ad management plugin Aparg SmartAd is the best in the stage of placement banners on your website. You can insert any image, video or etc (for more detailed description view in the article "How to setup banners using Aparg SmartAd WordPress plugin"). But how can you create this images (banners) for insertion? Let's step from theory to the practice! 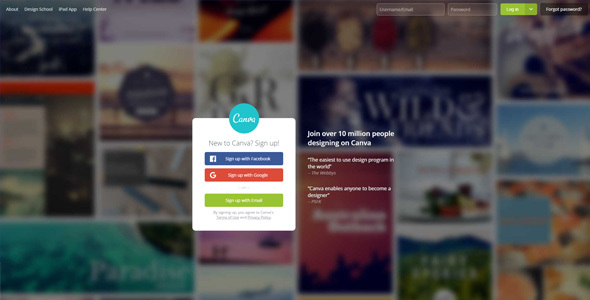 Please welcome, Canva! 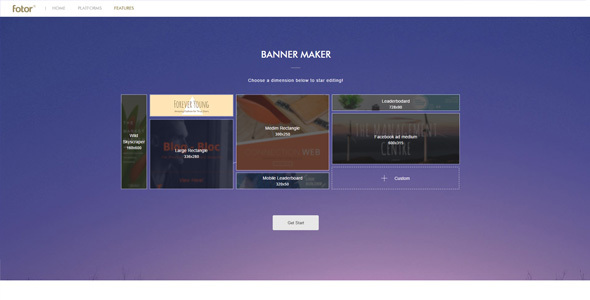 Really cool and helpful tool for banners creation and not only. After a very quick registration, you immediately go to the "desk". You may pass some tutorial course or get to work at once. Firstly, you have to choose which kind of design sample you prefer (for social medias, simple posters, maybe a card or something else). You can start the decoration process, once you pick up acceptable size and form of a future banner. Note, that all proposed sizes and positions for banners are perfectly suitable for displaying them on WordPress websites by Aparg SmartAd. Well, the design is the excited part of work. Really, it is so difficult to determine among this kind of large range of images, illustrations, colors, diverse layouts, frames, charts and funny icons. Let alone a countless number of text fonts. Nearly impossible to imagine something necessary that you will not be able to find here. Surely, Canva is the heaven for professional designers and ordinary people. The process of design is very attractive and inspiring. And what is the most amazing thing that this online tool with its base options that are absolutely free. However, for more features as unlimited folders or storage for photos and assets you need to pay $12.95 per month. Also, it is possible to pay for certain banners and buy just them. Anyway, you will enjoy your done work! Next is Fotor. It is a very popular and simple used online tool. It would be better to initially register to avoid future problems and take full advantage of proposed opportunities. From the first, you are offered to edit photos in detailed, make any collages or design a banner. For the latter, you pick the better size and form for the banner. Then on the screen will be opened an editor with a bunch of colorful and tempting templates. You can make any choice you want! After it, you are free to add from an unimaginable list of stickers. For your convenience, they are already sorted by certain themes. Plus the section of Design has all standard set of functions for creation and editing of banners. After the save of decorated banner try the section Edit. Here is offered a variety of special additions. You can upload your banner and make it cooler by the fantastic effects. Or you can place your banners into any acceptable frame. You know, it is also possible to partly smooth or reshape your photos. The best thing is that you can find all basic options for banners' creation and professional photo editing just in one tool. That's incredible! As for price, Fotor is free, but there are some extra functions which are possible to use after the upgrade. You can pay about $8.99 and buy a monthly access to the additions. But for long-term users Fotor has more profitable offer. You purchase an annual access which has overall price of $39.99 (it means that in this case you pay just $3.33 per month). It's great! The third one from the list is Bannersnack. As you see, the title says for itself. Again pass a few seconds registration and start your work. Online service offers to make banners in the formats of HTML5 or Flash. Depends on the size you will see proposed templates. Among them, there are not only common models but also animated types. You may choose from them or create your own from scratch. The choice is yours! Each banner is reflected as a combination of layers. In its turn, each layer has a small optional desk to adjust the color, font, size and position. There is an overcrowded library of images (and quick search line for them). Also, a variety of special button that you can put on your banner. It is very useful tool for ad campaigns. By the end do not forget to save. You will have an opportunity to download the banner to your computer in the favorite form. Or instead of it embed a code into Aparg SmartAd then it will be displayed in your WordPress website. The advantage of this kind insertion is that any change that you do on your banner will be also updated on your website. No need for inserting again the code. 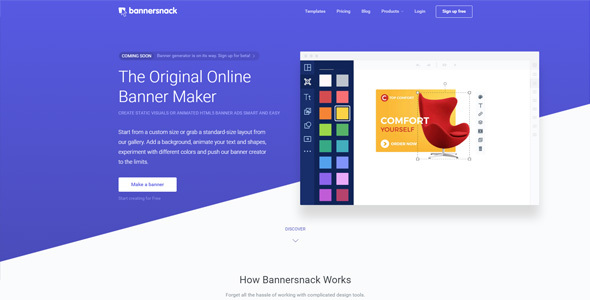 Bannersnack is free, but also with additional options for a fee. Depends on the number of options that you want to use the price is different. There are three suggested "sets" of options. In general, the price is fluctuated from $7 to $48 per month. To conclude, it is a good help for even inexperienced users to create really beautiful and attractive banners. Are you still here? Let's get this done!